Ski mountaineering on the Merrick in Galloway, my local hill, March 2013. The skiing was excellent as well as the climbing! The snowiest mountains in Scotland are generally the northeast and the Cairngorm mountains, but in these areas the hills tend to be covered in heather and so may require deeper snow cover to be skiable. Near the west coast the hills are often grassy so sufficient snow cover builds up quicker, but mild westerly air strips snow quicker as well. Flexibility is the key to successful skiing in Scotland. Being lucky enough to get the time off work when there has been recent snowfall and good weather is just the right combination. Also useful are an old pair of skis and skins, good kick turning and step turning techniques and an ability to pick a good line when the grass shows through the snow.! There is good skiing in the Cairngorms towards the east of the Scottish Highlands, and they tend to get more snow and slightly better weather......although I have also had to drag my skis along the ground while crawling into a 150kph wind here...... A classic short tour here is the round of the Northern Corries, passing over the summits of Ben Macdui, Cairn Lochan and Cairngorm, often finishing with a run down the shallow angled Lurchers Gully. Conditions here are generally at their best later in the winter and in early spring (i.e. late March and April). On Cairngorm in stunning weather, March 2014. Five skiers in a whiteout on the summit of Cairn Lochan, 1999. Around the ski resort of Glenshee are a number of good long and short day tours accessed from the A93, one of the highest roads in Scotland. Suggestions include Carn an-t Sagairt Mor and Lochnagar from Invercauld near Braemar. Also the Carn an Tuirc to Glas Maol traverse immediately northeast of the Glenshee ski area and the Glas Maol to Creag Leacach tour to the southeast. Bootpacking up through a steep section on Glas Maol. The summit of Creag Leacach on a windy day. 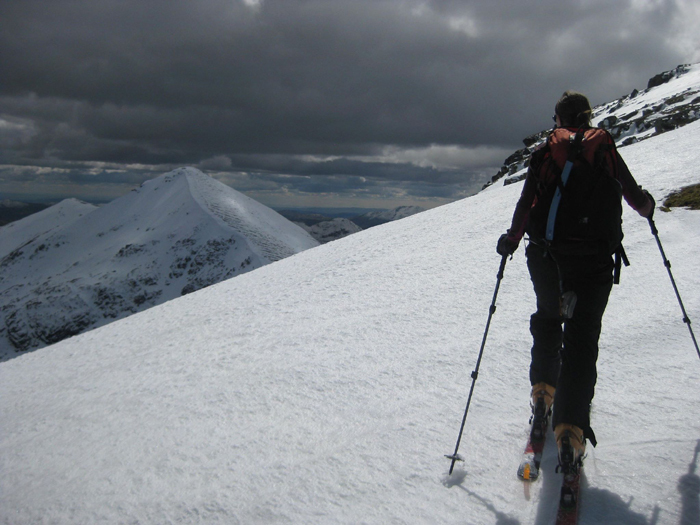 There is more good ski touring in the Central Highlands, Ben More and Stob Binnein by Crianlarich, Ben Alder southwest of Dalwhinnie and the grassy hills of the Ben Lawers range all provide plenty of high and steep terrain for some good skiing. many skiers start out from the high car park near the old visitor centre on Ben Lawers. 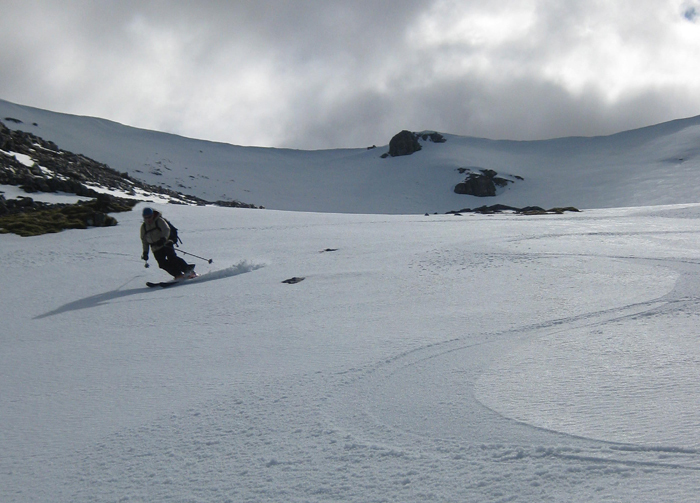 Skiing on Carn Gorm above Glen Lyon, 2014. Starting out in Glen Lyon. 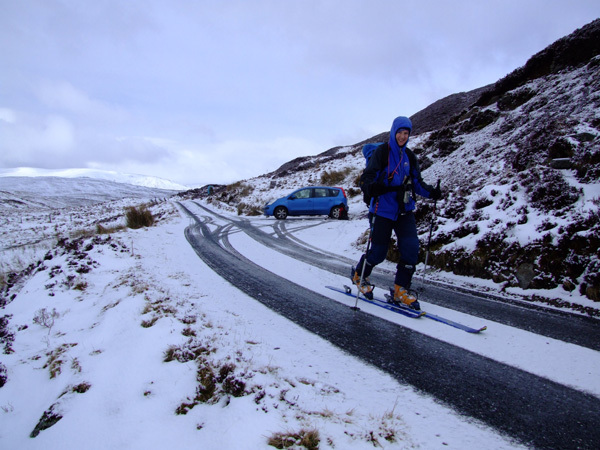 Skiing from the car along the Ben Lawers road, heading for Meall Corranaich and Ben Lawers. Good conditions for practising step turns and kick turns on the way back down. Further southwest the high peaks of Ben More and Stob Binnien, just south of Crianlarich, give a classic high level tour with some steep options. The northeast face of Stob Binnien is particularly good. 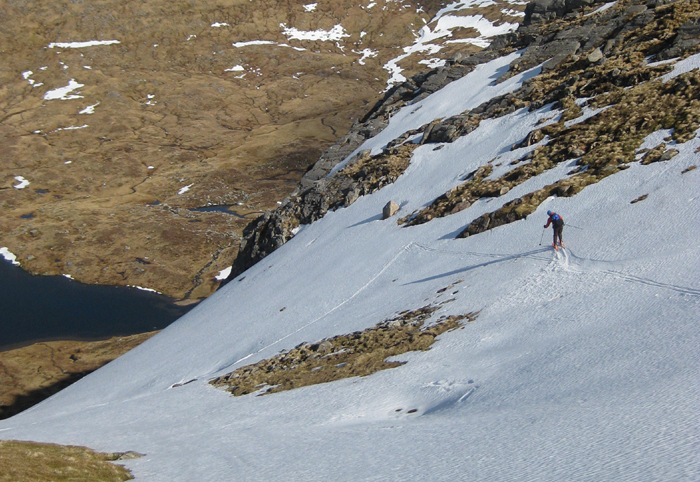 Skinning up towards the summit of Ben More in May 2015. Stob Binnien is the peak in the background, with the steep northeast face on the left. There is usually better and deeper snow cover in the west highlands of Scotland than towards the east... although this can be highly variable. The downside is that the weather is often worse... milder, wetter and cloudier. Ben Nevis, 1345m, the highest peak in Scotland and highest peak on the whole island of Great Britain, is located just a few kilometres from the sea. One of the best areas for touring in Scotland are the high peaks and plateaus of the Mamores range, just near Fort William. The summit of Aonach Mor in particular makes a very easy day out due to the presence of a gondola uplift (telecabine). A longer option is to ski round from Aonach Mor over Carn Mor Dearg and onto the summit of Ben Nevis. Some of this tour is on pretty steep terrain. Skiing down the southeast ridge of Ben Nevis towards Coire Leis, May 2015. Traversing the Grey Corries Ridge, Mamore mountains, Scotland. 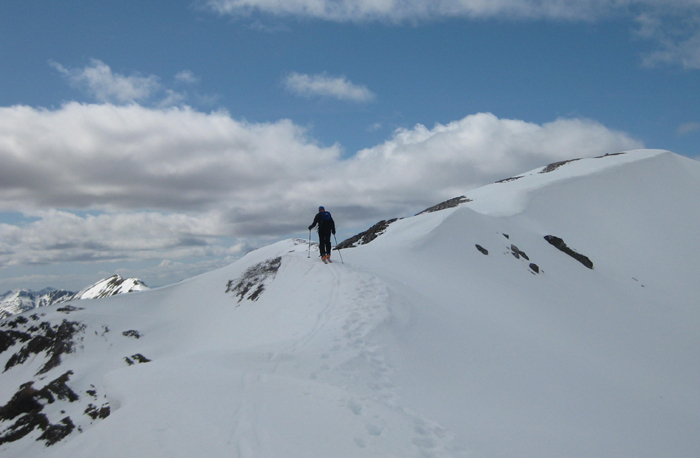 Skiing the peak of Stob Choire Sgriodain in Lochaber, spring conditions. One problem in Scotland is that there is not always snow! Myself and Linda skiing down from Lowther Hill towards the Dalveen Pass, in great snow conditions, March 2010. 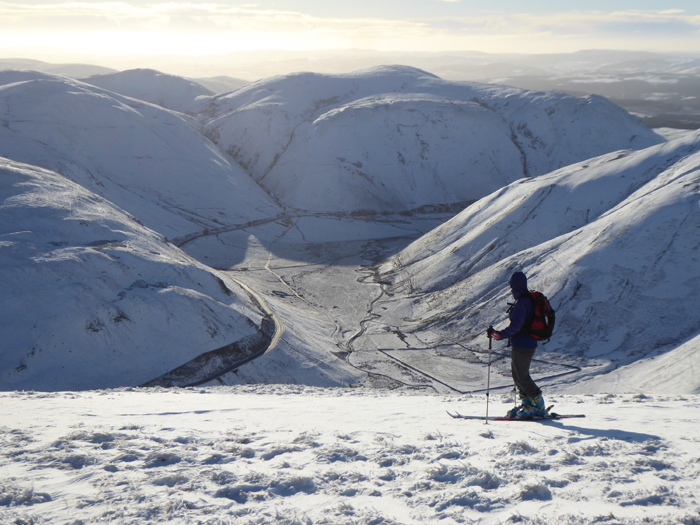 Ribbon skiing high on the Merrick, the highest point of the Southern Uplands. 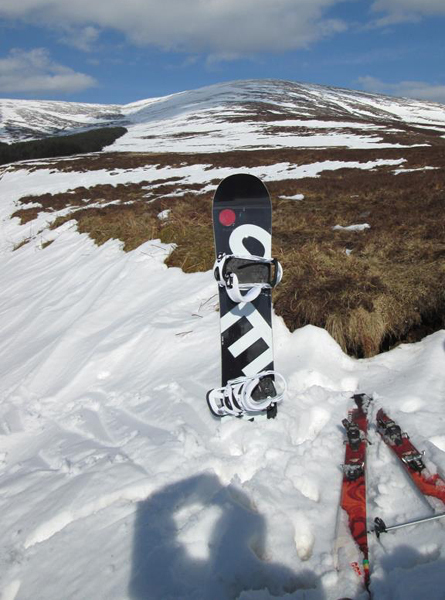 After a great run on the snowboard down Cairnsmore of Fleet, April 2013. 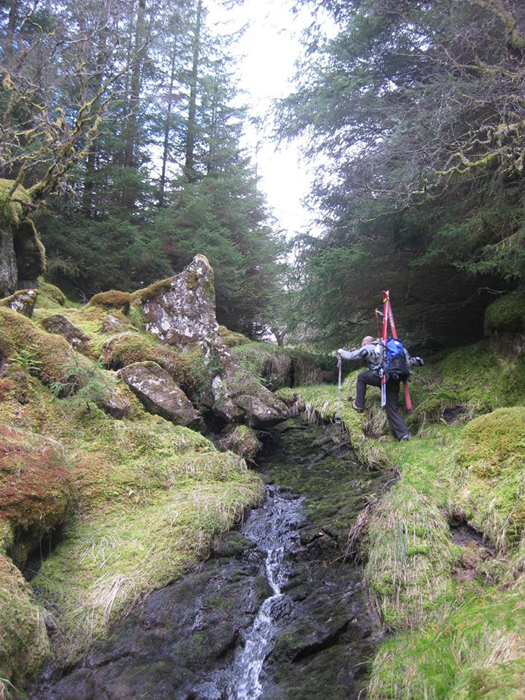 For more on skiing in this most unusual corner of Scotland see the page on Galloway Ski Touring.